Good timing on this one, as there has been a lot of chatter about how nuclear power is going to save the climate, following a recent op-ed in the New York Times. The Big Buildout of nuclear that happened in the 1970s glossed over a number of questions about safety systems in the new facilities. In 1971, a series of tests for critical Emergency Core Cooling Systems for the already under construction (!) plants, failed – prompting a hasty few weeks of hearings in Washington, to figure out some kind of industry-acceptable patch for the critical system. Those changes resulted in large cost increases and schedule delays of plants well along in the construction phase. Regulators and tree huggers were blamed, but when Three Mile Island melted down in 1979, it was precisely that safety system, jogged by some human error, that was at fault, burning up 2 billion dollars in gear in 20 minutes, and effectively stopping the industry in its tracks. Those who were carefully watching the technology knew that, economically, the industry was already dead in the water even a few years earlier. And, right, I’ve heard all the “but nobody died” arguments. See how that helps when you’re asking investors for 12 billion dollars over 15 years. Arguments can certainly be made, as above, for other forms of nuclear technology, but nothing can speed up the timetable that proving such systems requires. Indeed, the same “ready, fire, aim” approach is still very much a part of the industry’s playbook – and may be responsible for enormous cost overruns in recent US projects that resulted in the cancellation of the V. C. Summer plant in South Carolina, and similar issues at the still-building Albert Vogtle plant in Georgia. A decade ago, industry officials were predicting a “nuclear renaissance” in a country that had not broken ground on a new reactor since the 1970s. The South Carolina utilities selected an advanced reactor design from Westinghouse Electric Company, the AP1000, reported to have more safety features than earlier models. The utilities planned to build the two reactors next to an existing nuclear unit at the V.C. Summer plant in Fairfield County. But pitfalls soon followed. Construction began before Westinghouse, a subsidiary of Toshiba of Japan, had finalized its AP1000 design, and several safety changes had to be made midway through the process. Engineers struggled with the complicated, novel project, as various components needed to be reworked. “This was a first-of-a-kind project, so it was always going to be hard,” said Rich Powell, executive director of the ClearPath Foundation, a clean-energy group in Washington. “But you can also see this as a symptom of a broader problem. We’ve let our nuclear industry atrophy for 30 years, and we’ve lost the robust supply chains and expertise needed” in building reactors. Nuclear proponents often cite several other countries as models of how a nuclear industry should be run, and these arguments may indeed have merit, but time is short for a hasty brain-and-heart transplant for the US industry. Moreover, China, often cited as on the nuclear forefront, and known as a country with little patience for pesky naysayers, is running into some of the same types of issues that have plagued projects here. My own greatest concern about nuclear as a climate solution is weapons proliferation – and although there are ideas for new technologies that supposedly circumvent that problem, getting to that tech is going to take a while, and the issue is now. In a previous video, I set up an interview with Dr. Jacobson as a conversation – cutting to another interview with Bill Gates. Juts to throw some numbers in, France’s nuclear fleet has an overall capacity factor of 75%. Offshore wind isn’t any more far away from that. More than 60 percent is standard these days, and the bigger ones provide 63%. Cheaper, and far quicker installed than nuclear. As a bonus also the smaller carbon footprint of wind power and no toxic waste. All the nuclear reactors in a country don’t shut down at once ( unless the population have been listening to Greenpeace too much ). Pretty much all the wind farms in a country often do. The capacity factor of the French reactors is ‘only’ 75% because they’re used for load following – their availability factor is about the same as other advanced nuclear countries. In places where nuclear is competing with fossil fuels, rather than other reactors, the capacity factor can be over 90%. Since they’re often refueled at seasons of low demand, to be ready for mid-winter and for midsummer air conditioning, when they’re really needed CF is often 100%. For solar on winter evenings, that will be 0%, and for wind it’s a lottery. French nuclear is more often showing ‘incidents’. Due to a heating climate, French nukes are now frequently shutting down because of a lank of cooling water. Germany then is helping out with their coal power (still 40% of their mix, most of that even lignite). When a nuke fails, you’re losing a gigawatt or more in just seconds. Meanwhile, wind can be forecasted for many hours in advance and the grid can easily be adjusted therefore. This is every day’s business of the grid operators. The most modern wind farms in the North Sea have been getting about 45% capacity factor. The entire US fleet of nuclear reactors last year had a 92% capacity factor. So you’d need half as much again to equal the output from a one gigawatt reactor. If you built battery or pumped hydro as well, to cover the calm periods, you’d have to add more capacity, to cover the efficiency losses of storage. Modern “offshore wind provides a capacity factor of 60%. The floating offshore turbines in the Hywind Scotland project hit 65 percent recently. Capacity factor of offshore wind generation is currently growing by 1% per year. The U.S. Energy Information Administration (EIA) claims an overall capacity factor of 92% for nuclear in 2018. How do you explain an overall CF of 100.7% for January 2018 then? Are the name plates not big enough? Maximum power ratings for reactors were calculated conservatively, based on heat flows in the reactor and power trains, materials degradation over time, etc. With forty years more experience plus research, and improved computation methods and processing power, the limits have been raised.It helps that in January the cooling water for the reactors is colder, so since the turbines run off the temperature difference between heat exchanger outlet steam and the condensers, they pick up a few percentage points in efficiency. Plus power companies know in advance what time of year peak demand occurs, and usually make sure all their reactors are loaded in advance, with preventive maintenance done. Here’s the current reactor status – you can see that the great majority of plants are running at 100%, and that’s not even at a stressful period for the grid. Wind in California is currently running at 59%, in Texas ( Ercot ) at 36 %, and in New England at 5%. So we can see that some reactors provide 0 zero and the others are running exactly 100% (which is quite weird, no power station runs at exactly 100%). Means you have or have not a coupe of gigawatts. As I previously said, when a nuke fails you’re losing one or several gigawatt in a matter of seconds. Meanwhile wind can be forecasted many hours in advance. What is now more stress on the system grid? These are snapshots. Onshore wind power performs with a typical capacity factor of ~30%, offshore wind can double that. Figures for the performance of Danish offshore wind turbines – those for British, German,and Belgian fleets are also linked. None are over 50%, either lifetime or rolling one-year CF, including those only a year old. This link shows that wind power peaks and lulls are correlated right across northern Europe, so the dictum that ‘ the wind is always blowing somewhere’ is not much use unless you have intercontinental-scale, multi-gigawatt transmission, as well as several times the capacity for peak demand at both extremes of the line. That’s assuming the goal is actually to eliminate fossil fuels, and not just to ‘ needlessly multiply (RE ) entities ‘. I’ve observed before about the huge lead and construction time for conventional nuclear plant (>10 years). 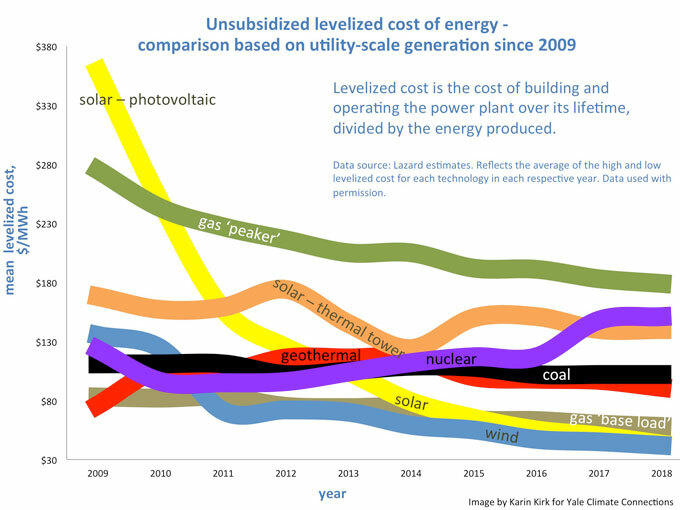 Unconventional plant (Molten Salt Reactors and Small Modular Reactors)) are utterly unproven and, because of that, lead and construction times are increased probably to the order of 15 – 20 years. Added to this the limited number of sites suitable for such plant. OTOH the renewable solutions are here, now, have far fewer siting problems and can be scaled to suit most demand. Add to that various energy storage methods and the case for nuclear vanishes up its own wazoo. French energy company EDF has signed an agreement with the Chinese utility China Energy Investment Corporation (CEI) to jointly deliver two offshore wind power projects in China. Seemingly the Chinese can’t even satisfy all their demand in RE installation by domestic firms. I think we are just watching China becoming the world leader in RE generation. 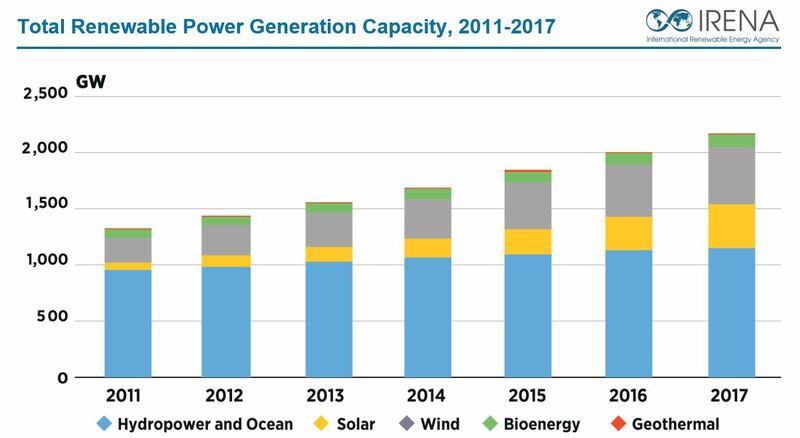 In terms of installed capacity and generation they already are. If you talk to strongly disinformed arfs (anti-renewable fanatics) they’ll tell you all about the curtailment of Chinese wind power. With last year’s 35% drop in battery prices, and the virtual certainty of continued drops, that should be moot. 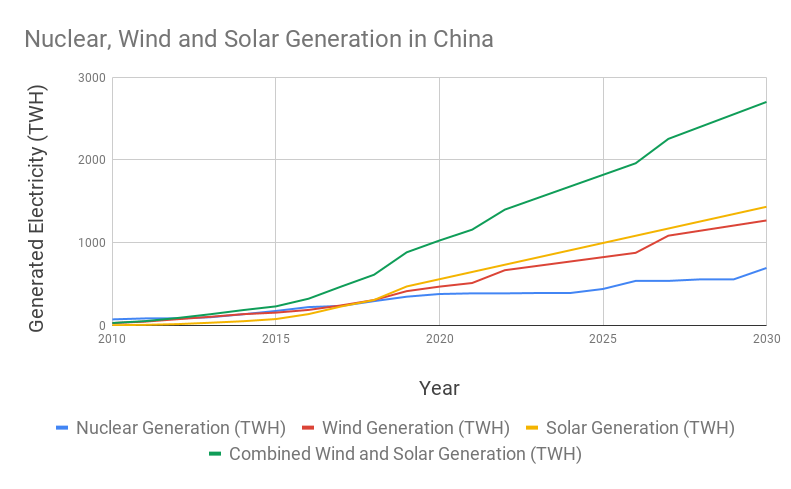 I’d love to hear if the Chinese are concentrating on building storage for the turbines and solar PV they already have; that should help them even more than more wind right now. (Once they’ve caught up with enough storage to curtail curtailment, it will make sense to keep adding wind and PV as well as dispatchable renewables. I am curious about why the Chinese, who have been leading in wind, solar, HSR, and EV bus deployment for years, don’t seem to have contributed to the leading edge of wind, as in having their own 12 MW or larger models. Or maybe we just don’t hear about their advances. In Europe and in the US the curtailment rates for renewable energy are between zero and five percent. The problem in China is an underdeveloped grid. The country is ramping up renewables at a pace nowhere else being seen on this planet. Absolutely. Part of the ‘underdeveloped grid’ problem that could cause that is not enough geographic distribution/interties; part is not enough storage. In California, ex-Governor Brown’s legacy shopping was a bunch of energy bills including the 100% clean energy goal. One that was sorely needed there and across the country, but didn’t pass, was one to connect California’s grid better to points east. There is some curtailment, and since one of the bills was a law requiring most new houses to have solar, there’s more to come unless the state installs more storage (which it’s doing) and passes that bill. All power you can distribute via interconnection doesn’t need to be stored or curtailed. Work started on the United Arab Emirates Barakah nuclear power plant in July of 2012, it is a conventional plant, except for an adapted cooling system due to the very high temperature of the Persian gulf waters, which will get even hotter as climate change progresses. Of the four reactors the first was completed last year, the second has just completed acceptance testing, the remaining two are expected to be completed by 2021. U.A.E also is pursuing renewable energy and was part of the consortium responsible for the London array. As Climate change intensifies the MENA region will need all the power it can get, as much is predicted to be inhospitable to human life for part of the year. 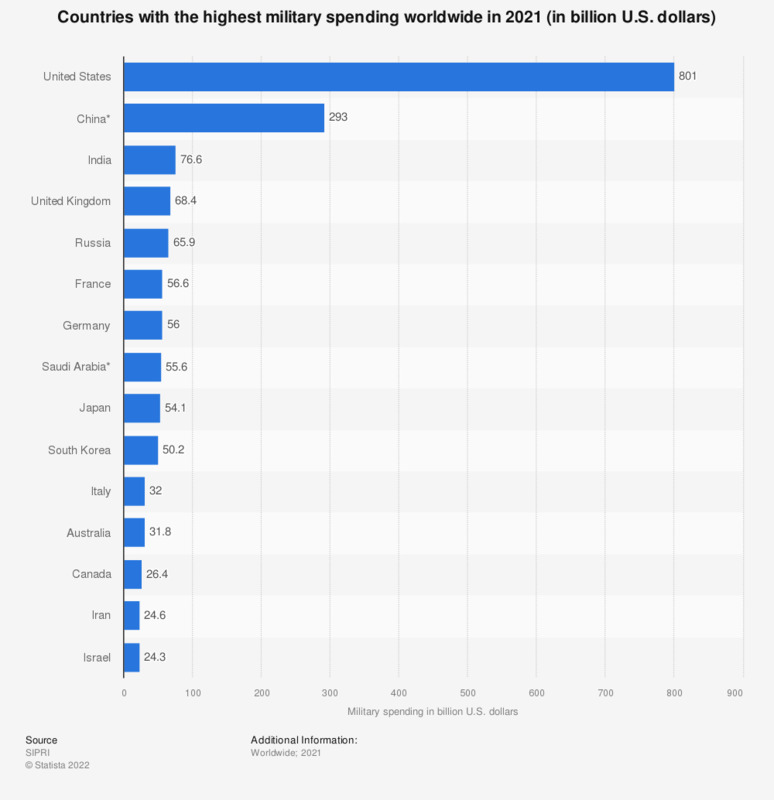 The construction cost is around $25 billion USD. Did I say ‘inhospitable” ? if only that was all . .
That means the lead time had already occurred. The lead time is what happens beforeconstruction starts. As I noted in an earlier post the construction time can be as short as 7.5 years. Construction time in China, Japan and South Korea is about five years. ( It used to be similar in the West, before the paperwork required came to outweigh the reactor.) That’s for thousand megawatt plants with forged, foot-thick pressure vessels and huge containment domes. Reactors of quarter the power, running at atmospheric pressure, and made in a factory, should be much quicker to make, and could be sited anywhere a coal plant is. They’d take less room than the coal storage yard, use the same powerlines and coolant water, and kill a lot less people from air pollution. Not only do costs plunge, but, as jfon points out, timelines would be shortened drastically. We need to focus on what SHOULD and COULD be rather than the present process that impedes progress. Reactors got bigger so they’d be cheaper. Now the big ones can’t compete with wind and solar, which will be made virtually dispatchable (99%?) by batteries and other storage. Smaller reactors are more flexible, which is what’s needed in the grid now, but they can’t even compete with big ones. Conservatives, the base for nukes, have to choose between their market religion and their bigmanlymachine bias. You can talk about lead times and construction times and mass production and standardization but we have 7 years left to eliminate human emissions before we face exponentially rising risk of such serial and simultaneous disasters that we’ll be unable to implement any solutions at all. How many generations of Vogtles and V.C. Summers will it take to get lead plus construction times under 7 years? How much safety and how many deaths will we have to sacrifice for speed, since the dishonesty and unsafe practices of the nuclear industry in the US are the reason there are more regulations than there used to be in the days of the wild west. The contract was awarded to South Korea in December of 2009, and started in July 2012, I’m not privy to internal procedures leading up to the tender, I would think this would be in line with a $25 billion contract award. It did not suffer from the politicking of say Hinkley “C”. Lead time includes geological and hydrological studies. cooling water access overflight problems, infrastructure planning (you need roads and port facilities to import materials), piling and foundation planning. These last are essential given that UAE is built on a sedimentary rock structure much of which is oil reservoirs. For $25bn you get about 12GW offshore wind installed with a capacity factor well above 60%. This can be done in 2-3 years. And around the circle we go. Will building these units cause fossil fuel burning plants to be retired? Answer: Not many and not fast enough to matter Fossil fuel use is still rising in many places. Why are we not building these wind farms everywhere and using them to retire the dirty fossil fuel plants? What’s YOUR answer? They are being built. but not fast enough. If Germany had retired more coal plants they wouldn’t have to export their excess electricity due to the rise of RE. Good old CleanTechnica! They are so bright-sided and PERKY! They remind me of HS cheerleaders (and they wave their “projection pom-poms” around with as much vigor). Sources are in the article. You just need to read it. ‘I did read it and it wasn’t a bad article compared to many of CT’s more “cheerleading” ones. I object to treating projections as fact, and tht was what I was joking about. PS In academia, “sources” and “references” are NOT the same thing—I saw not a single “source” cited, and one would have to go through all the “references” to fact check the article, which is really nothing but opinion, although it appears mostly credible. is all “opinion”? You must be a super teacher, dumbo. Ir’s 2 AM in Ireland, Chucky. I hope you haven’t imbibed too much Guinness and have stayed up late to “pontificate”. Clean Technia is not by any means “academia”, it’s a business pushing tech solutions—sort of lobbyists. Academia means places of teaching and learning. I’m sorry you don’t understand the difference between source and reference, Chucky. Try again—When one writes an article without attribution besides some paraphrasing, that’s OPINION until one goes to the REFERENCE material used and locates the info, fact-checking it and then citing it. Stating an opinion about an opinion is not the way science works, although it seems good enough for those who make a living babbling about what’s going to happen on the future. Any clearer? Well. It says “References” at the bottom of the article. You know? All that stuff I cited in my last post. My sincere apology, milord the super teacher. I’m still learning. I know you’re long beyond that stage. It’s now 2:30 AM in Ireland, and Chucky is still at it?. Perhaps he should google “sources vs. references” and maybe he’ll find something there that’s easier to understand than what I’ve said. I give up. Sir Charles – I lived by the Persian Gulf for a significant part of my life – it is not blessed by persistent trade winds and I doubt whether turbines would be suitable there. (I have not researched this and there could be other parts of the country suitable for wind). The country is blessed by sun, plenty of it and it is finally being put to good use. However no one should rely on a single source and I think that nuclear is a good answer for that particular part of the country, that is geologically stable. I do get tired of people arguing for their favorite non/low carbon power source, especially when they start flouting their mathematical prowess with algebraic formulas and bashing the well meaning “Greenpeace” organization. Personally I think that marine power has a lot to offer for Island states like my own country (which has a long standing no-nuclear policy), and I would much rather that than nuclear be employed, it may be of use to the Emirates also. It is fine to say that we must conquer “fear and ignorance” but there are still uncertainties and unknowns lurking with our past nuclear past, we don’t have an answer for every risk yet associated with gaining power from decay. That said “our” people need looking after as Climate Change intensifies and the known state of nuclear power use offers hope where no other solution exists. Well. You just said that the region is predestinated for solar power. If you think that there wouldn’t be any problem with security/health and the unsolved waste problem, where I don’t agree, why don’t you consider price and construction time. Maybe in the future the sun will not always bless the Emirates, there are threats including Geo-engineering, weather change, persistent sand storms and super-volcanic activity, it needs backing up with another source, why not nuclear (they can afford the expense – thanks to the petro-dollar), if wind is not available or desired. It is their choice and protecting the lives of the desert folk are the most important thing. We are not all living in temperate zones after all. If there’s really “super-volcanic activity” then you don’t need any more nukes to heat the water. I forgot “Nuclear War” and If you do not like Super volcano in the list try something like an intense Mount Pinatubo eruption which would make solar powered life difficult. Who would of thought we would even be having this discussion, back in the mid 20th century. Who would have thought that large swathes of this world would become ‘”inhabitable” and whole ecology groups were in danger of collapsing. Who would of thought educated biologists would be talking of the 6th extinction. Not me. Agreed – that is one of the reasons why I would not welcome nuclear in my home country, which like Japan is also located on the Pacific ring of fire. However the Arabian Peninsular is not a high risk country for Volcanic/Earthquake activity (as far as I know), I would also trust that this was researched before the contract was tendered and awarded. I trust that the nuclear industry has learned from the Japan incident. Maybe I’m more trusting than you, but I would not think the industry would want a repeat as it would definitely finish any future hope of revival. Probably the reason why French EDF is now going for offshore wind. Now totalling around £9bn of investments, the NLF was first set up by the government 25 years ago to help ensure the UK’s nuclear industry is able to meet its security and environmental responsibilities, such as nuclear waste management and power station decommissioning. Established in 1996 as part of preparations for the privatisation of British Energy – now incorporated within EDF Energy – the Fund is underwritten by the UK government and covers the eight UK nuclear power stations currently owned and operated by EDF, including Dungeness B, Hinkley Point B, and Sizewell B. And the region is oh so stable politically, which doesn’t really matter much for nuclear reactors and radioactive material anyway. You keep asking why not do nukes there, as if the many answers aren’t incredibly obvious. Why not ask what the problem is with relying mostly on solar with storage in a country in which the sun shines brightly every day and it rains 11″ a year? In fact, besides having one of the highest potentials for CSP in the world, Saudi Arabia has some pretty fair wind and geothermal potential, too. A combination of dispatchable renewable sources like that, peaking at the time of peak demand with wind and solar PV, batteries and other storage cheap enough to easily get through every single day all year… I’m not seeing the need for nukes or fossils. Most probably will be terrible. Quite likely will be catastrophic. In any case, expensive and deadly beyond belief. That a needed part of the solution has problems is not a cause for celebration. the botched nuclear industry is a tragedy – but that doesn’t mean we have to throw bad money after good. renewables work, and, and as Elon Musk recently said, it’s odd that some folks think we’re smart enough to store nuclear waste for 200,000 years, but too stupid to figure out how to store solar energy for a few days or weeks. My comment was of a general nature, primarily in anticipation of the usual nuclear squabble. Certainly it has been botched and in more places than the USA. That means it has to be fixed. Many countries are successfully running nuclear with associated low carbon footprints. There will be gaps in renewable power which, at present technology, will be filled by nukes or fossil fuels. And we will need a LOT of power in an all electric world. I question the use of “botched”. Planes fall out of the sky, automobiles strike fixed objects at high speeds, and ships sink—we don’t refer to that “technology” as “botched”, and it is an oversimplification to say that of nuclear. The NYT piece identified the real “botch” with nuclear—-FEAR & IGNORANCE, and the sooner we admit that, the more intelligent the argument will become. What Plutonium are you talking about? Plutonium 241 of course, the isotope that decays into the Americium being talked about. Slow down, Chucky, you’re over-revving again. You have to really read these things you look up to get the science. Plutonium-241 with a half-life of 14.4 years, which decays into Americium-241 with a half-life of 432.2 years, which then decays into neptunium-237 with a half-life of about 2.14 million years. For interest, last heard, Americium was the ‘active’ ingredient in most smoke alarms. Obviously not a lot of it. In Geology 101 at UBC, Vancouver BC, were told about two radioactive layers in river sediments. These correlated to major periods of atmospheric nuclear testing and provided excellent timing lines. That’s right, and it’s so “safe” that you can just throw the detector in the trash when replacing it. Do not remove the Americium and ingest it—-that’s not healthy. Do you not recover and recycle waste from electrical and electronic equipment in the US? Yes, but you have to take them to a recycling center—-they will not be picked up at the curb. The lazy ones just throw the smaller stuff in with the regular garbage even though they may recycle their cans, paper, bottles, etc. Although a few places ask that smoke detectors with Americium be turned in separately, most don’t because it’s not that much of a worry. Less than 0.3 microgram. You’d need 3.5 million smoke detectors to gain one gram of Americium-241. It’s not any part of the solution; it’s a distraction from and disruption of the solution and a desired part of the attempt to preserve profit and ideology for the oiligarchic right wing. Has it ever occurred to you that the “oiligarchic right wing” is trying to preserve its profits and ideology by being one of the forces behind the anti-nuke movement? Even our current light water reactors leave more fissile material in the ‘spent’ fuel than there is in natural uranium. Uranium ore is 0.7% fissile U235, which is enriched for fuel to about 5%. After five years or so in the reactor, there’s still 0.8% U235 left in the rods – plus 1.2% plutonium, much of which is equally useable. In fact, you could reclad the light water fuel and use it, as is, in a Canadian heavy water reactor. Fast reactors would use that, plus the 90% remaining U238 in the fuel rods, plus the 7x again as much depleted uranium left over from reprocessing.So the fuel which provided about ten percent of the world’s electricity for the last forty years could still make about eighty times as much for another forty years. With such an incredible store of energy available, the chances of it still being regarded as ‘waste’ in 200,000 years is zero. If humanity survives, we will use it. Fast reactors aren’t science fiction, either – several are already in use. Batteries which could power a country till the wind turbines start spinning again ARE science fiction. The largest battery in the world, Musk’s $100 million South Australian plant, has enough juice to power that state for about two minutes – and South Australia has only 7% of Australia’s people. To run Sydney for a week of calm nights would take thousands of them. The SA battery is listed at 129 MWh, the state looks as though average demand is about 1500MW ~36,000MWh per day. That would actually be 25 minutes, though I’m not sure how power demand looks there in winter. The battery is actually being used mainly for frequency regulation, not backing up wind; that provides the bulk of its revenue. More batteries would not get those funds, nor would it be necessary if more power was from heavy generators spinning with a lot of inertia -like hydro, steam, gas and nuclear. Nor could a lithium ion battery be daily run down below 50% of charge without greatly shortening its life. This wonderful site will give you power production for all the Australian states for the last day – plus where the power came from, interstate transmissions, how much CO2 resulted, and electricity prices. It does the same for about thirty other countries as well. If you scroll around, you’ll see that low CO2 emissions in a country equate fairly closely to how much hydro and nuclear capacity they have. My own grid, in New Zealand’s South Island, is usually the cleanest on earth, just from the luck of having few enough people to go~100% hydro. Norway is similar. Places with more people and less hydro are generally in the hundreds of grams CO2 per kilowatt hour – except for France, Sweden, Switzerland and Ontario, which have enough nuclear for baseload, and enough hydro for peak power. The graph shows the lowest CO2 intensity for South Australia with 450g/kWh. Ireland has an overall intensity of 325gCO2e/kWh. The current CO2 intensity can be followed here. Irish fuel mix is ~45% renewables (mainly onshore wind), ~40% natural gas, ~10% coal and ~5% peat and others. No significant storage. No nuclear. The SA battery turned out surprisingly brilliant for your stated frequency maintenance, good for the planet, and also crash prevention. Everyone should have one. A second battery would be less useful and a third basically a waste of space at present technology. Suspect trying to power the whole state would be counted in seconds, at peak summer load, which is the most likely time. Not there for that. Did enjoy your hate Finland link. Hocketing clean safe renewables in a grid is an industry in its infancy; to criticize it and say it can’t do things because it hasn’t yet (except where it has) is like criticizing an actual infant for not bench pressing as much as you do. Places with less hydro generally have more solar, and vice versa. Often, solar-blessed places have enough for CSP or can connect to it. Since hydro is well developed throughout the world and solar PV and CSP have only recently come down in price enough to be deployed by our insane society, they’re not as widespread. 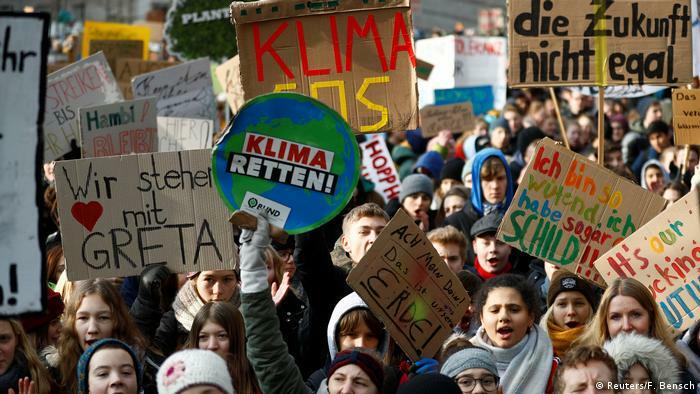 They soon will be–maybe fast enough for civilization to survive if anti-renewable ideologues can stop telling lies and putting constant obstacles in the way, and we prioritize their development as they should be. Many places also have geothermal, onshore or offshore wind that haven’t been developed. With wind’s increasing power and capacity factor, and with batteries dropping incredibly fast in price, and other storage on the verge, the situation with SA is temporary, and typical. Enough batteries can be added everywhere to use them as storage and auxiliary services without draining too much of their charge. Having the reserve can act as a real emergency back up. Good points all. Some points from the NYT piece that caused all the recent “chatter”. Well, an oil and gas engineer would give you a different view again. Germany is still relying on dirty coal (40% of their mix), most of that is even less efficient lignite. No real “energy transition” at the bottom of that graph. Yep—-the only obvious “transition” is that energy from renewables is being used to power growth and replace nuclear rather than replace fossil fuels. That’s why I keep harping on COAL, and Germany is a poster child for how it continues to use fossil fuels—remember too that Germany is the world’s fourth biggest economy after the US, China, and Japan (sixth in CO2 emissions),so this IS a big deal—-we’re not talking Norway or Sweden here..
Another “transition” that is just beginning to show is the increase in natural gas use, which is going to be powered by more gas from Russia, making Germany, a NATO member, more dependent on an enemy of world peace. Swell! Because the so-called big partner is sooo peaceful. Gimme a break. BTW, Germany didn’t only replace nuclear with renewables. They could have long decreased the use of fossil fuels. But they decided to export the surplus electricity instead of shutting down “cheap” coal. 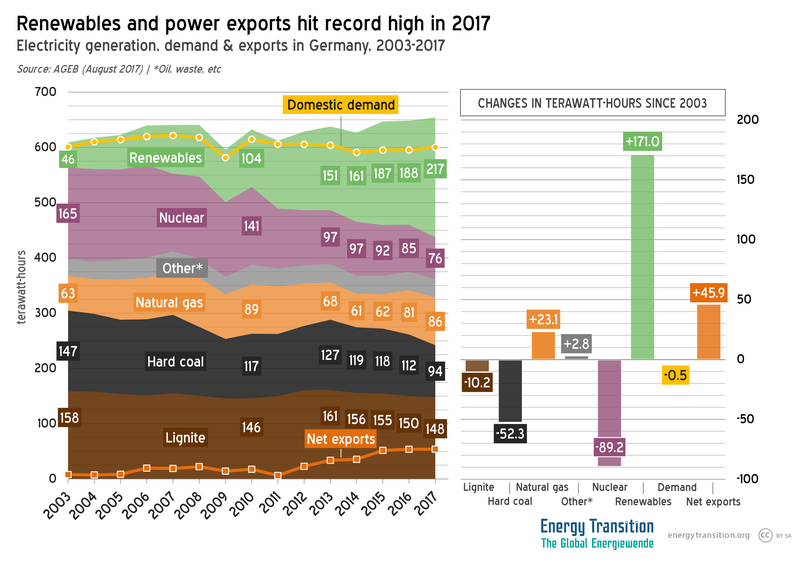 Since Merkel from the conservative party is their chancellor, the energy transition has basically stalled. That’s all due to big lobby of carmakers and utilities. Any other “conclusion” is just the attempts of a troll to confuse the issue, as Chucky seems to be doing all too often. I leave that trolling to dumb old guys. Well, when you are unable to read a graph, I rest my case then. Perhaps Chucky hasn’t really looked at the graph. Or perhaps he doesn’t understand it? Or more UNlikely, he has that VERY rare Purple-Green-Orange color blindness? No matter, what we’re sure of is that he thinks we are stupid and disrespects what this blog is all about—seeking truth. What that graph shows is a decline in nuclear from 165 to 76 (-89), an increase in renewables from 46 to 217 (+171), and a decline in fossil fuels from 368 to 328 (-30). (all in terawatt-hours). I won’t further insult everyone by doing the fifth grade math to convert that into %-age of increase or decrease. As I said, natural gas is beginning to show an upward trend, RE is mainly going to replace renewables rather than replace fossil fuels, and fossil fuel use is declining only slowly. PERIOD!—-that’s incontestable! It’s obvious that Chucky is either supremely ignorant of how to read a graph himself or he’s a shameless and deliberate LIAR. (I vote for the latter—-since a fifth grader could read the graph, he’s lying, and IMO, doing it for for pay. Shameful and sad). Construction of Olkiluoto-3, a 1,600-MW EPR unit, began in August 2005 and is about nine years behind schedule. A matter for celebration Chas? Why should I celebrate wasted money? And why should I celebrate wasted time? Worrisome my arse, you love it. Aside. ‘Offshore wind power’ costs drop 45% according to ‘Wind Power Offshore ‘ inc.
Why should I love that the industry is trying to undermine safety regulators? Because I love European citizens being endangered? Because, with all the sh’t, crap & crappee in this world, now and the future, this comes under trivial. A ‘report’ that a country run for decades on nice low carbon nuclear, dosn’t know what it is doing makes copy if not sense. Also, what the hell are you going to do about it? Worrying should be a search for a solution, otherwise it is an energy sink. Much easier to say than do of course. I think I’m posting plenty of solutions, Brent. Are you in total denial now? Pretty much in line with what we can hear in the video and read in the article Peter posted. You are posting OPINIONS of journalists and anti nuke activists. How about posting the opinion of NASA or other people that do not have barrows to push. This is tedious and pointless. Feel free to have the last word and I’ll try not to respond. NASA does not do nuclear research, to my knowledge, but I get it that anti-nuclear folks tend, like so many communities, to be too insular. The point of the video is that it gives two examples of prominent efforts by knowledgeable folks to create “new” nuclear options, which have run into trouble. so, by all means, have at it, but let’s not foreclose the existing tech by over investing in such long term efforts. I posted articles which deal with the subject AND the conclusions of scientific studies. Also, since when is investigative journalism “opinion”, Brent? Still in total denial? Since when is it “opinion” when lawmakers found three major areas of risk? Since when is it “opinion” when a leaked report is being published? And of course we can see another libellous comment by this dumb old guy. Where am I “anti-RE”? BS! It’s just getting ridiculous again here. The only sane comment so far comes from Peter. It’s getting ridiculous here? Yes, it IS ridiculous to see you continuing with this foolishness when you’re getting the s**t kicked out of you. You seldom post “articles” here but just give us LINKS, and you’ve already shown that you don’t know the difference between citations, opinions, sources, and references. You hope to bury us in BS, most of which you don;t understand, and brainwash people with “word bites” and “pretty pictures”—-that brainwashing intended to lull them into NOT recognizing your REAL aim—that of prolonging the life of fossil fuel use. BTW, Peter, I don’t think I’m anywhere “insular”. It’s only looking like between all these unsubstantial comments. Well, a piece of sh!t cannot insult me. But everybody can smell it. Finland is still planning another gigawatt-class reactor, though understandably they’ve chosen a Russian design this time. They are also looking at low power ‘swimming-pool reactors’ for district heating in the bigger cities – even some Green party candidates are in support of this.